They also looked at seven unfavourable effects, but only three, constipation, dry-mouth, and dizziness, showed clinically relevant differences among the six drugs they considered. The 14 drugs plus placebo are listed here, with figures that represent the benefit-safety balance of each. Green figures indicate the best benefit-safety balance; Red the worst. Reductions in the frequency of OAB symptoms define each drug's favourable effects, and frequencies of side effects are classed as unfavourable effects. After the favourable effects have been weighted for their added clinical value they are described as benefits. For the unfavourable effects, the inverse of their weighted loss of value is referred to as safety. The resulting benefit-safety balance does not consider contra-indications, interactions with other drugs, or any precautions. 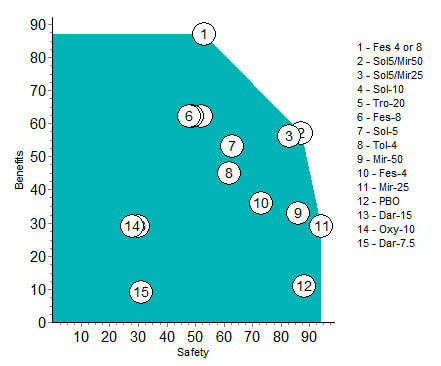 The following table shows the scores separately for the benefits and safety effects, and their total weighted average, which is the benefit-safety balance. Bar graphs after the 75-25 weight is applied show the separate contribution of benefits and safety to the total. Note, for example, that three drugs scoring lower than the placebo are all less safe than the placebo, but their benefits are insufficient even to bring their total score above that of the placebo. Another way to look at the benefit and safety information is to show each drug's two figures in a 2-D plot. This figure facilitates comparisons of the drugs. The top rating of fesoterodine 4 or 8 (flexible dosing) is due to its high-scoring benefits, while the two solifenacine/mirabegron combinations are safer, but lower in benefits. ​Note that flexible dosing of fes 4 or 8 is more beneficial and safer than 4, 5, 6, 13, 14, and 15, while the sol/mir combinations are more beneficial and safer than most of the remaining drugs. In other words, only fes 4 or 8 and the sol/mir combinations are better than all other drugs for their benefits and/or safety. All the above is based on (1) the following data, culled from available public sources, and (2) experts' judgements about the clinical relevance of the data (i.e., the effect weights). To support patient-oriented prescribing based on the evidence, green shading identifies the best drug for each favourable effect and the worst drug for each unfavourable effect. %delta is the reduction in number of episodes over a 24-hour period. ​% is the percentages of patients who experienced the side effect. Pfizer initiated this project and Pierre Fabre supported it. ​A paper is currently being written up for publication in a refereed journal.